Method: Bring water to boil per Tinkyada package instructions. Once water boils, add brown rice noodles and cook per package instructions. Have strainer ready and be prepared to rinse the noodles when they are cooked. In second large pan over low heat, add oil and onions, and spices (oregano, basil, parsley, salt, pepper). While those are warming together, chop sausage and add to pan. Raise heat to medium/low and add mushrooms. Cover to speed up mushroom coking time, stirring as needed to prevent any burning. While mushrooms are cooking, add tomato, balsamic vinegar, 3 cloves pressed or minced garlic. Cover and let cook. 5 minutes before noodles are ready, add 3 cups chopped spinach to sauce pan and let cook, uncovered. Mushrooms should look cooked, but still retain some thickness and texture. All greens will be cooked and or wilted. Mix sauce well and pour over rinsed noodles. 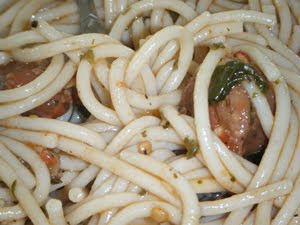 If using a lidded container, shake the noodle and sauce mix to ensure noodles are well coated. Serve over a bed of spinach and enjoy! If you can eat dairy, sprinkle a small amount of feta or parmesian over dish before serving.